This photo reminds me of a Christmas morning. I woke up early and there near the foot of my bed was a bike, I’d been longing for a bike but not that one! Although it had been painted I knew it was my cousin’s old bike and even with its new paint job it wasn’t pretty. The brush strokes were clearly visible. I’m sure Mum & Dad knew I was disappointed as soon as they saw my face. I didn’t know how to ride a bike and some time later the son of Mum’s best friend was visiting and promised to help me learn. I insisted that he mustn’t let go of the back as I rode around the lawn but I must have appeared confident because he did let go and I crashed straight into the wall of the house. I told him off and he just said, “I thought you could ride”. 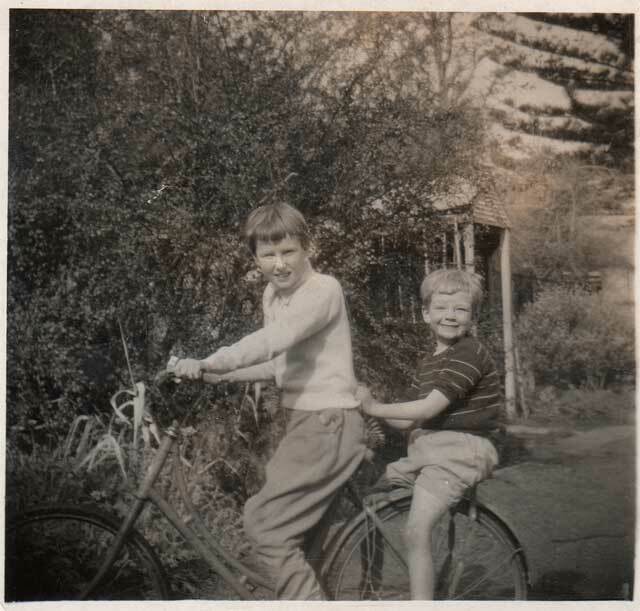 Not only hadn’t I really learnt to balance but the brakes worked by pushing back on the pedals and I definitely hadn’t mastered that. He was most apologetic and I guess I was lucky because as far as I remember only my pride and trust were dented. I rode that bike the 2kms to school every day until I was banned from doing it by the doctor because of “growing pains”. I did get another bike, a reward for doing well in a music exam, that was also second hand but I was thrilled with it. It was English, had a lovely soft seat, 3 gears and even a light that worked by either batteries or dynamo. Dad took the batteries out because he said they would only go flat, I never really understood it, he could have left them until they did but I certainly couldn’t have told him that! This entry was posted in That Reminds Me and tagged culture, family, memoirs, musings, reminiscing by macmsue. Bookmark the permalink.